When the final buzzer sounds and the fans exit the arena and the teams go back to their locker rooms and media head for the interview room underneath the stands of Pinnacle Bank Arena, the court becomes quiet and empty. But senior point guard Glynn Watson Jr. stayed there after Wednesday night’s 60-45 loss to No. 24 Maryland (18-6, 9-4 Big Ten). Still in uniform, Watson surrounded himself with a few team managers to rebound for him and started hoisting jumpers, trying to make amends for the first scoreless game he’s had in a Husker uniform since the 10th game of his freshman season. He played 13 minutes that night. Against the Terrapins on Wednesday, Watson played 38 minutes and missed all 10 of his shots. He’s made five of his last 32. There’s frustration. There’s the realization that this once-promising season is nearing an unsatisfying conclusion. Nebraska, now 13-10, has lost six in a row and eight of its last 10 games. But Nebraska is still trying. “We’ve been working extra,” forward Isaiah Roby said after the game. “Everybody’s getting extra shots up. It’s not like we’re not putting in the work. The biggest issue that continues to plague the Huskers — confidence — was on display once again Wednesday night. Nebraska seems fragile at the moment. Hot starts quickly turn to lengthy scoring droughts. Momentum dissipates as quickly as it arrives. When center Tanner Borchardt picked up his second foul with 11:15 to play in the first half, the Huskers held a 15-8 lead. Once he sat down on the bench, Maryland ripped off a 15-0 run and the Husker offense ran dry. Senior guard James Palmer Jr. was called for an offensive charge a few plays later. “I thought he wasn’t as aggressive [after that],” Miles said. Roby, who opened the game taking seven of Nebraska’s first nine shots and scoring 13 of its first 16 points, missed three free throws in the span of a minute late in the first half. Miles thought he “he turned down his aggressiveness a little bit” after that. The Huskers finished the first 20 minutes with 20 points and 20 missed shots on 26 attempts. In an attempt to spark something — anything, really —Miles swapped sophomore combo guard Thomas Allen for the longer, springier Thorir Thorbjarnarson. He took one shot in 12 minutes and missed it. Allen played 29 minutes and scored seven points on six shots. It didn’t work. Miles tried to eat a technical foul with 13 minutes to play in the second half when Borchardt tried to draw a charge on Maryland’s Bruno Fernando in the post. Borchardt didn’t get the call and Fernando came down with a foot on top of his chest after going up for a dunk. An irate Miles charged onto the court and earned a whistle. “I did that on purpose,” Miles said. Probably in an attempt to light a fire underneath a sputtering team. Nebraska scored 15 points in the last 13 minutes and missed 20 of its last 24 shots from the field. It didn’t work. Nothing has for the last month or so. The 45 points was the lowest ever at Pinnacle Bank Arena and the first time Nebraska has been held below 50 in a game since Feb. 22, 2015. 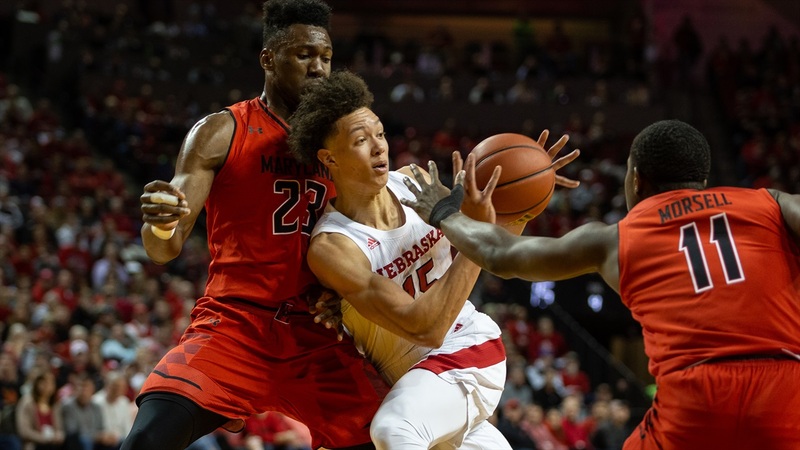 The Huskers finished shooting 21 percent from the field, marking a season-low, a Pinnacle Bank Arena low and the worst percentage in over a decade. “I don’t see anybody having fun,” Miles said. “I see stressed out young guys. We need to get back to the love of the game and be able to relax. This is the time of a lifetime. Some of these seniors only have nine more games and this is it. So, let’s play with a little bit of joy. I know they want to do well but if all you’re worried about is the outcome and the consequence of that, then you’re going to get stressed and you’re going to have problems. Roby sees that. His aggressiveness to start wasn’t in the gameplan, he said, but rather a product of him reading and reacting. He hit a triple for his second bucket — taken with no hesitation — and fired up another attempt early as well that helped open up the lane for him. Then he started turning down open perimeter looks and the Terps started packing the paint. Watson did the same. Palmer, who finished with 12 points on 2-of-13 shooting (0-of-2 from 3), did the same. Nebraska isn’t scaring teams from distance lately but they still need to try and make the defense guard the perimeter. Maryland’s twin towers — Fernando (13 points and 19 boards) and freshman Jalen Smith (18 and 11) — weren’t stretched. They were allowed to roam the paint like safeties and protect the hoop. Nebraska shot 6-for-20 at the rim and was blocked five times. With nine games left and postseason play looking out of reach, Nebraska is pressing. That thought eats at the head coach. The next chance to do so comes Saturday in West Lafayette, Indiana, against Purdue (16-6, 9-2). Tip-off between the Huskers and Boilermakers is set for 7:30 p.m. CT on BTN.